After joining a research team you are sent out to mine valuable krawtite in Time Dream: Temporal Betrayal! Before the mission can get underway, the entire operation crashes on the runway. Use your Time Dream skills to find the saboteur and prevent the deadly accident from occurring again in this incredible Hidden Object game. 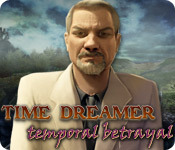 Invistigate a 60s flower child, a gruff professor, and an annoying slob as you try to track down the criminal in Time Dream: Temporal Betrayal!